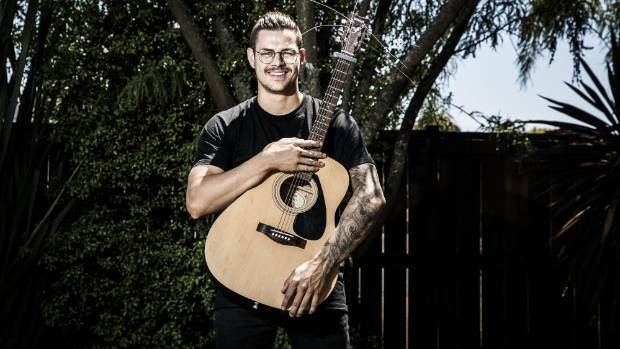 The rollercoaster continues for New Zealand singer Chris Black as he’s made it to the top 10 of an international music competition. Black, 25, is in the final rounds of American pop star Usher’s Megastar music competition. Last week he made the top 20 and he found out on Sunday he’s made the cut for the top 10. Chris Black is closing in on the finals of Megastar, backed by usher to go to L.A. He ranked sixth overall at the moment and needs to move up a place in the final four days of public voting to make the top five finalists who will go to Los Angeles to “battle it out” in front of the judges. “I’m just like a big bag of mixed emotions, excited and nervous,” he said. Usher launched the Megastar competition via an online app, where contestants upload videos of their music, with the winner taking home the top prize of US$1 million. The winner is chosen based on a voting system as well as judges who follow the competition and cast their votes through the app. From the thousands who initially entered the competition from the US, Canada, the UK, South Africa, New Zealand and Australia, only 10 are currently left. Black is the only New Zealander left in the running. mentioned the competition to him and urged him to give it a go. “It sounded a lot like X-Factor, I kind of turned a blind eye to it because I did that when I was younger and I wasn’t a fan of how it all works, it just wasn’t really for me. Black was born in Christchurch and grew up in Australia. He came back to New Zealand to enjoy the summer months, with the plan to move to Auckland at the end of the season. Black said he started singing and playing guitar when he was seven but it was only a couple of years ago he taught himself how to play piano. “I just fell in love with the piano and it was probably at that time that I realised this is something I want to do and pursue for sure. Usher had been one of his favourite childhood pop stars, but he’s branched out, taking inspiration from Ed Sheeran, singing anything from R&B to pop. Black said he’s done a few gigs here and there but mostly focused on growing a platform and audience on social media. “It seems to be the way to go,” he said. Black said his goal was to eventually live in Los Angeles and sign up with a record label. “It’s the place to be in the industry. To vote for Chris Black, download the Megastar app on your phone, log in with Facebook or email, search his name at the top, click on his video and cast your vote.